Towards the end of dinner around 10 o'clock, the ship suddenly shook like a car going over an unpaved road. This caused some shrieking and the volume of the voices rose considerably. When the shaking stopped, the volume started to subside. But just as it did, the ship began shaking again. One of the people at the table had her eyes closed and was reciting Hail Mary's. I had been on QE2 the year before when she threw a propeller shaft as she was leaving the dock in Fort Lauderdale. That event had caused a similar shaking. So my first thought was that the ship had suffered a similar mechanical problem. Speaking with Captain Woodall later, he said that he had had the same reaction. I have also read that then First Officer (now captain) Christopher Wells testified at one of the inquiries into the accident that he too thought it was a mechanical problem. Once the shaking stopped the volume in the restaurant returned to normal levels. The conversation turned to whether the ship was still moving. Because the flowers in the centerpiece continued to vibrate long after the incident, my theory was that the engines were still going. In fact, the ship did continue to sail on for some time after the incident. Because of the delays in tendering passengers back and forth from the ship to shore, QE2's organized shore ecursions were late returning to the ship. As a result, QE2 did not weigh anchor until 8:33 p.m. In order to arrive in New York on time in the morning, it was decided to cruise down Vineyard Sound at 25 knots. This is a relatively fast speed for a ship as large as QE2 in confined waters but the charts indicated that there was sufficient room for such action. QE2's officers assumed that the ship was just going to re-trace the course taken earlier in the day to reach the anchorage. However, at 9:44, the pilot ordered a change in course 15 degreees to the north, thus putting QE2 on a more northerly course. As was customary, the second officer proceeded to draw the new course on the chart. He noticed that this new course would take QE2 close to Sow and Pigs Reef. Alarmed, he alerted First Officer Wells. This potential problem was quickly brought to the attention of Captain Woodall. The Cunard officers then informed the pilot that the captain would prefer to return to the original course. Acquiescing, the pilot directed that the ship turn 10 degrees to the south in order to rejoin the original course. The charts for this area of Vineyard Sound off of Cuttyhunk Island showed a minimum depth of 39 feet. QE2 had a draft of about 32 feet so there should have been no problem crossing this area to regain the original course. Even taking into account the phenomenon known as “squat” there should have been anough clearance. Squat refers to the tendency of a ship traveling at high speed in shallow water to settle more deeply in the water than her normal draft. Captain Woodall indicated later that his experience with QE2 was that there was a one to two foot squat effect under such circumstances. However, the charts were based upon a survey done by the United States government in 1939. In those days, the depth was determined by taking a sounding at regular intervals rather than continuously. Thus, if the area in between the soundings was shallower than the sea bottom at the locations where the soundings were made, the shallower area would not be detected and would not appear on the chart. 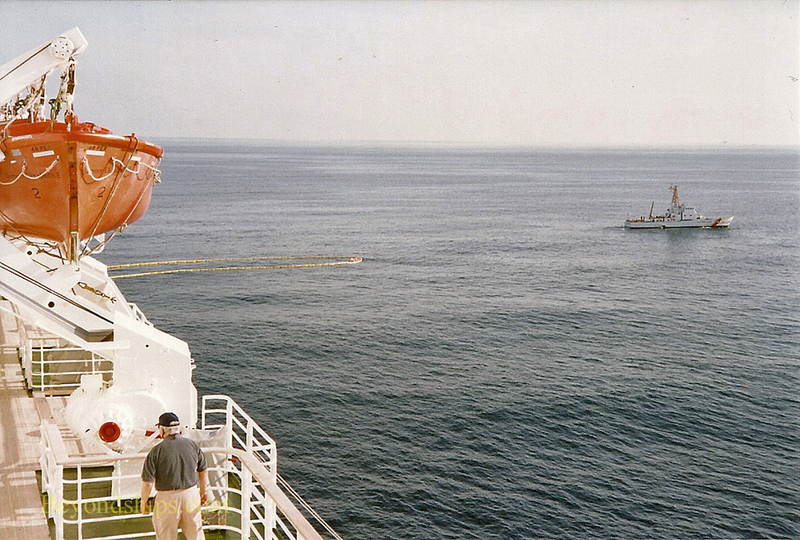 At 9:58 p.m. QE2 collided with the first of two underwater obstacles. Divers later found the remains of two rock pillars with red paint from QE2's hull on them, which apparently had stood in between two of the soundings made back in 1939. It was estimated that Red Rock I and Red Rock II, as they came to be known, had stood about 33 feet below the surface at the time of the incident. Above: Oil spattered on the side of Boat Deck. After dinner, I decided to go up on deck to see if anything was happening. Stepping out onto Boat Deck on the port side, I saw that the ship had now stopped. Off in the distance, I could see the glow of the lights of Newport. A large helicopter circled overhead shining a search light on the ship and then departed. Something which surprised me was that there were streams of a soft gooey black substance on the deck and on the sides of the superstructure. 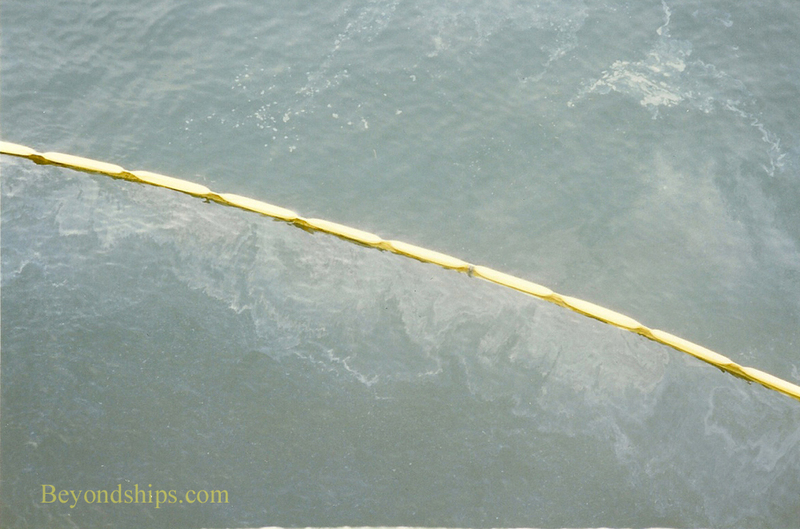 I was later told that this was oil that had been forced up the funnel by the collision and which had showered the deck like a geyser. Continuing around Boat Deck to the starboard side, I found a crew about to launch a lifeboat. Chief Officer (later captain) Nick Bates was going over the side with a flashlight to inspect the hull. I learned later that an internal inspection had found water in some of the ballast and fuel tanks that should have been empty. The question now was whether there was any visible damage to the hull outside and any signs of oil escaping. A short time later, Captain Woodall came on the public address system and said that the ship would remain at anchor for the night and therefore would not arrive in New York as scheduled. He went on to assure everyone that there was no danger to the ship. Nonetheless, I have heard that some passengers chose to sleep out on the open decks that night. In the morning, I awoke to find that QE2 was no longer alone. Two Coast Guard cutters were nearby as well as several small civilian craft. News media helicopters flew over us. Another new feature was a pollution containment boom that was looped around the after part of the ship. I was told later that at this time, a debate was going on between Cunard and the federal authorities over whether the ship would be allowed to proceed to New York. Cunard believed the ship was seaworthy but the authorities were concerned about oil leaking into New York harbor. You could see that there was some fuel within the containment boom but not much. The fuel tank that had ruptured was empty when the accident occurred.